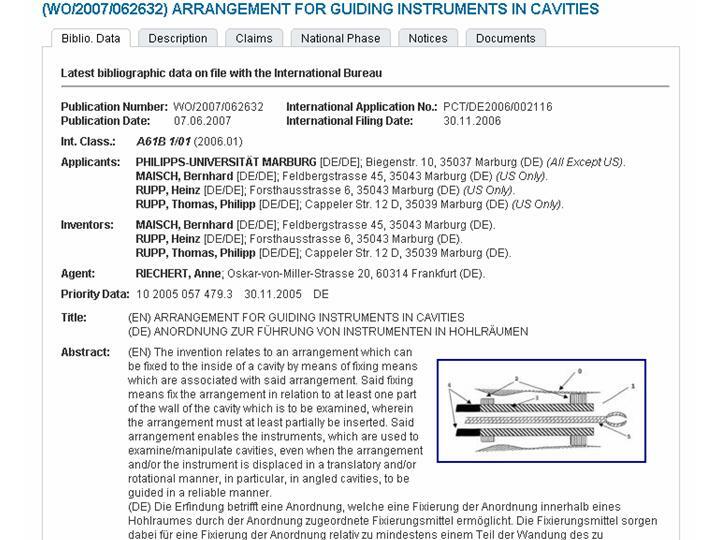 Update 13/12/2011: EU patent on our key technology for minimal invasive pericardial access with the AttachLifter is granted. Tissue is traditionally grasped with forceps or a rigid suction head (upper left corner). To reduce suction pressure required for tissue attachment, we developed devices with flexible sealing clamps (lower left corner). Less suction pressure relates to less tissue injury while the tissue remains more firmly and securely attached. 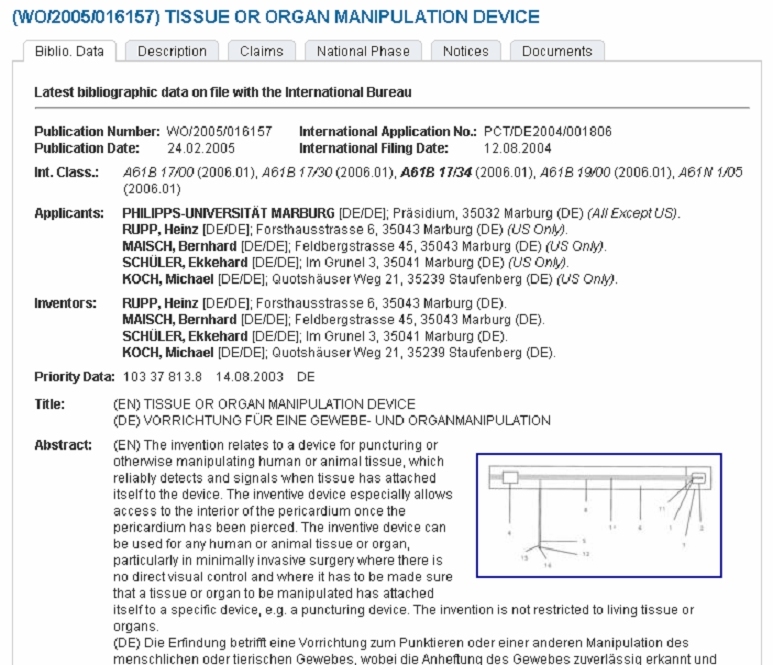 An electronic device is available for monitoring secure tissue attachment. When the device is turned, e.g. by 90°, the tissue is lifted, i.e. AttachLifter. This approach is used for accessing the normal pericardial sac, where the pericardium is very close to the underlying epicardium and where there is a high risk of puncturing the epicardium with the inherent risk of fatal pericardial tamponade, i.e. the risk inherent in the conventional needle technique. The devices can be used stand-alone or in a working channel of an endoscope. The applications are manifold. Currently, the example of pericardial access is described in detail. The pericardium is lifted away from the epicardium using a suction head with flexible clamps followed by insertion of a needle into the pericardial cavitiy. Without the flexible clamps, turning of the suction head can be associated with loss of vacuum due to the irregular tissue structure of the pericardium with subsequent failure of accessing the pericardial cavitiy. Intrapericardial procedures for cardiac regeneration by stem cells. Need for minimal invasive access (AttachLifter) to the normal pericardial cavity. In view of the only modest functional and anatomical improvements achieved by bone marrow-derived cell transplantation in patients with heart disease, the question was addressed whether the intracoronary, transcoronary-venous, and intramyocardial delivery routes are adequate. It is hypothesized that an intrapericardial delivery of stem cells or activators of resident cardiac stem cells increases therapeutic benefits. From such an intrapericardial depot, cells or modulating factors, such as thymosin β4 or Ac-SDKP, are expected to reach the myocardium with sustained kinetics. Novel tools which provide access to the pericardial space even in the absence of pericardial effusion are, therefore, described. When the pericardium becomes attached to the suction head (monitored by an increase in negative pressure), the pericardium is lifted from the epicardium (“AttachLifter”). The opening of the suction head (“Attacher”) is narrowed by flexible clamps which grab the tissue and improve the vacuum seal in the case of uneven tissue. A ridge, i.e.,“needle guidance”, on the suction head excludes injury to the epicardium, whereby the pericardium is punctured by a needle which resides outside the suction head. A fiberscope can be used to inspect the pericardium prior to puncture. Based on these procedures, the role of the pericardial space and the presence of pericardial effusion in cardiac regeneration can be assessed. The flexible clamps provide also a long sought tool for providing a fixation point required in all endoscopy work. The fixation point providing a stable operating environment is one of the advantages of rigid endoscopy but is absent in conventional flexible endoscopy. The stable operating environment is particularly important for intra-luminal surgery where surgery is performed with an endoscope inserted through a natural body orifice (NOTES). This aspect has been pointed out e.g. in "Stabilizing instrumentation for the performing of endoscopic surgical procedures". Some stabilization can be provided by pushing the side of the endoscope against the body conduit or gastrointestinal wall, but this technique does not adequately allow a surgeon to manipulate the tissue of an internal body lumen to perform precise surgical procedures. A fixation point is essential for intra-luminal surgery using an endoscope because, without it, the risks of inadvertent perforation, uncontrolled bleeding, and unacceptable surgical margins are high. A fixation point can be provided by the suction head(s) with flexible clamps. For example, biopsy of the stomach wall or other manipulation as part of a NOTES procedure can be performed after fixation of the device (e.g. AttachGuider) with flexible clamps. 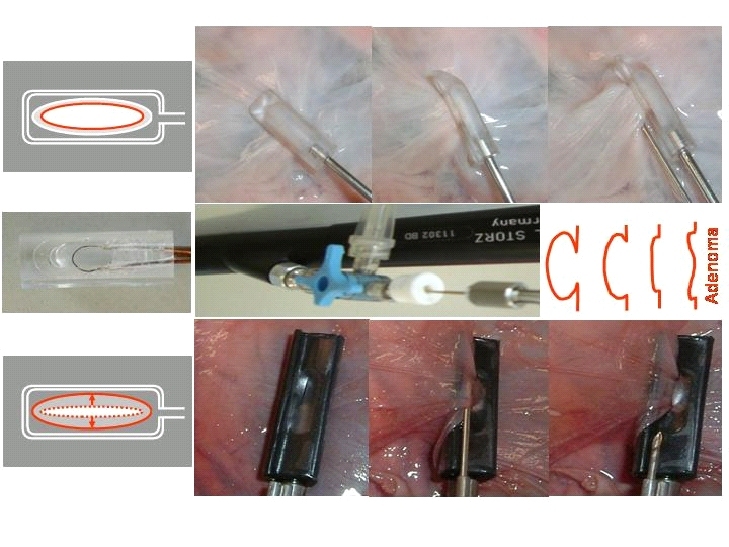 In the most simple approach, the device has a "working channel" with a conventional flexible endoscope with small diameter which after fixation is used for the tissue manipulation. Without a suction head with flexible clamps, the conventional endoscope could not be properly positioned. It appears that the suction head with flexible clamps according to Rupp et al. provides a major breakthrough in flexible endoscopic surgery. A possible application is also in Transanal Endoscopic Microsurgery (TEM) which is a minimally invasive technique for the local resection of rectal tumours. TEM was developed in 1983 by Professor Dr. Gerhard Buess in Tuebingen, Germany and is used now worldwide, e.g. in over 100 US sites. For details on the procedure, see Burghardt J and Buess G, Floyd ND and Saclarides TJ or Dana R Sands. While in TEM the size of the suction head is not critical, a smaller size is required for a regular endoscope when the suction head is within the working channel or remains outside and is used "in tandem" with the endoscope (as described in principle for our AttachGuider). Irrespective of the design, the suction head could also be used for biopsy or resection of flat polyps or adenomas (Endoscopic Mucosal Resection, EMR). Very flat polyps can be impossible to snare and even after submucosal saline injection cannot be snared. Currently, there are at least two approaches available: a snare which can dig into the mucosa such as the barbed snare or the "cap with suction" technique. Using a cap with suction (see e.g. Fig. 25 of ERBE), flat polyps can be grasped, lifted and snared. The advantage of the AttachLifter device over conventional vacuum grabbers is the greater grasping force despite a lower suction pressure. The flexible clamps have a sealing function, thereby preventing loss of vacuum when uneven tissue is attached to the head. The tissue grabbing is not lost when the suction head is slightly tilted since the captured tissue is kept within the suction head also by mechanical forces, i.e. tissue is "behind" the sealing clamps and cannot easily "escape" from behind the sealing clamps. The AttachLifter and associated devices have been developed at the Department of Internal Medicine and Cardiology of the Heart Center and the Technical Development Plant of the Medical Center and Medical Faculty of the Philipps University of Marburg. Karin Rupp, Michael Koch, Ekkehard Schüler, Hermann Schön. TransMIT GmbH works at the interface between universities and businesses. TransMIT assists scientists in protecting their inventions and provides assistance in the marketing of technologies and developments. 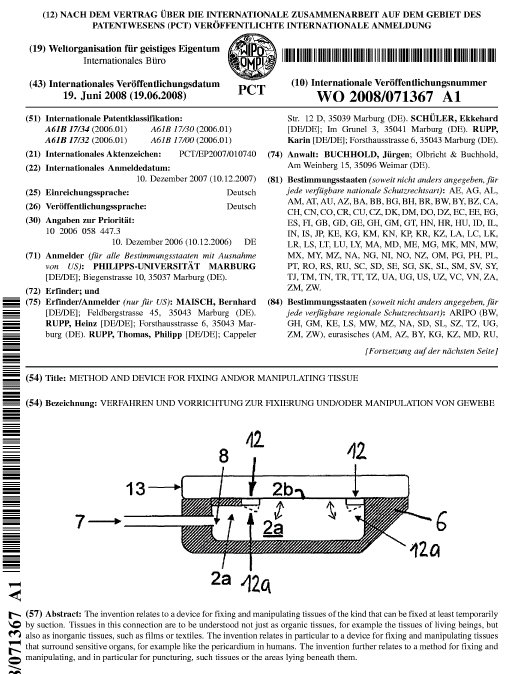 For information on the patent of the AttachLifter and follow-up devices, please contact Dr. Peter Stumpf, Managing Director, TransMit or Heinz Rupp. For information on the use of the AttachLifter in general surgery, please contact Dr. Thomas P. Rupp, M.D.